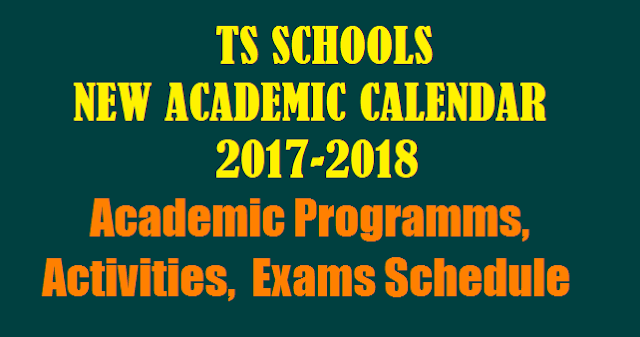 TS Schools New Academic Calendar 2017-2018 - Academic Programs, Activities, Exam Schedule, Holidays, Closing day, Reopen day, Schools Timings, School Games, School Complex Meetings Schedule. Telangana State Schools New Academic Calendar 2017-2018 - Academic Programs, Activities, Exam Schedule, Holidays, Closing day, Reopen day, Schools Timings, School Games, School Complex Meetings Schedule. TS Schools New Academic Calendar 2017-2018 - Academic Programms, Activities, Exam Schedule:TS Schools New Academic Calendar Programmes, Activities Schedule 2017-2018 #TS Schools New #Academic #Calendar 2017-18 Programmes, Activities Schedule/ TS Schools Academic Year 2017-2018-FA 1,2,3,4 SA 1,2 Exams Schedule, First, Second Term Holidays,month wise working Days,TS Schools Academic Calendar for the year 2017-18 and other programmes, activities for the next academic year have been developed by the SCERT Telangana. In this Draft Academic Calendar 2017-18, Main Activities Schedule, Next Academic year start date, Summer vacation, Schools Reopening, Syllabus distribution, Examinations schedule, Term Holidays like First term holidays(Dasera), Christmas holidays for Christian minority schools, Second term holidays(Sankranthi) for Other than Christian minority schools, Summer vacation and Month-wise working days details are available. These details are given here. The draft academic calendar for the year 2017-18 have been developed and it is proposed for discussion for finalisation of TS Schools Academic Calendar for 2017-2018.